The launch of a brand new series by the internationally bestselling, critically acclaimed author of The Coroner’s Lunch With worldwide critical acclaim, Colin Cotterill is one of the most highly regarded “cult favorite” crime writers today. Now, with this new series, Cotterill is poised to break into the mainstream. 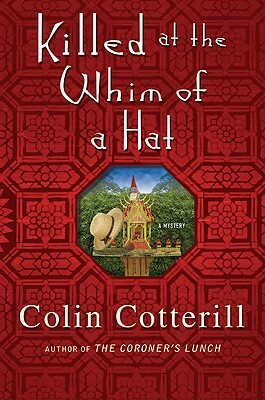 Set in present day rural Thailand, Cotterill is as sharp and witty, yet more engaging and charming, than ever before. Jimm Juree was a crime reporter for the Chiang Mai Daily Mail with a somewhat eccentric family—a mother who might be drifting mentally; a grandfather—a retired cop—who rarely talks; a younger brother obsessed with body-building, and a transgendered, former beauty pageant queen, former older brother. When Jimm is forced to follow her family to a rural village on the coast of Southern Thailand, she’s convinced her career—maybe her life—is over. So when a van containing the skeletal remains of two hippies, one of them wearing a hat, is inexplicably unearthed in a local farmer’s field, Jimm is thrilled. Shortly thereafter an abbot at a local Buddhist temple is viciously murdered, with the temple’s monk and nun the only suspects. --Janet Maslin, The New York Times "Excellent ... Cotterill ... combines a wry narrative voice with an appealing picture of a world unfamiliar to most Americans." --Publishers Weekly (Starred Review) "An ebullient series kickoff." --Kirkus Reviews "Cotterill's fiction has been compared to Alexander McCall Smith's, presumably because it also has a colourful location. It is far more complex and perceptive." --The Independent "A procession of memorable local characters.... By coming up with an original and entertaining new formula, this author reaffirms his creativity and versatility."